Summer Recreation Program Dates & Hours of Operation: The 2016 CREI Summer Recreation Program will be June 13th, 2016 to August 5, 2016. Program hours are M-F, 7:30 am – 5:30 pm. This program is for children ages 5-15, 5 year olds must turn 6 by September 1, 2016 (Documentation Required). Due to the high participant demand for the City of Albuquerque’s Community Centers’ Summer Recreation Program, the Family & Community Services Department has implemented a Lottery process for selecting participants. Parents/Legal guardians interested in their child/children participating, must complete a Lottery Form at the facility they wish their child/children to attend and will be asked to show proof of residency with one of the following documents. The name of the parent/legal guardian entering their child/children into the Lottery must match the name of the proof of residence document. Lottery Forms will be provided and accepted from Monday, April 11, 2016 – Friday, April 22, 2016 at each of the City of Albuquerque community centers. You can fill out a Lottery form at the facility you wish your child/children to attend for the Summer Program. The Drawing will take place at each community center on Wednesday, April 27, 2016. Times will vary (please contact the community center for times if you wish to witness the drawing). The Lottery Forms will be drawn based on the participant limit for each community center. The names of the children will be listed in the order drawn. Those who are City of Albuquerque residents (per City Council) will have priority. Should slots still be available, non-city residents will then be accepted until all slots at each center are filled. 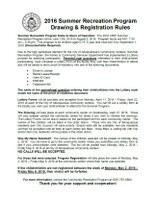 Once filled, a waiting list with City and/or Non-City residents will be posted in the order drawn. Was My Name Selected? The names of the children selected will be posted on Monday May 2, 2016. You will have to go to the community center where you submitted your lottery form to see if your child/children were selected. 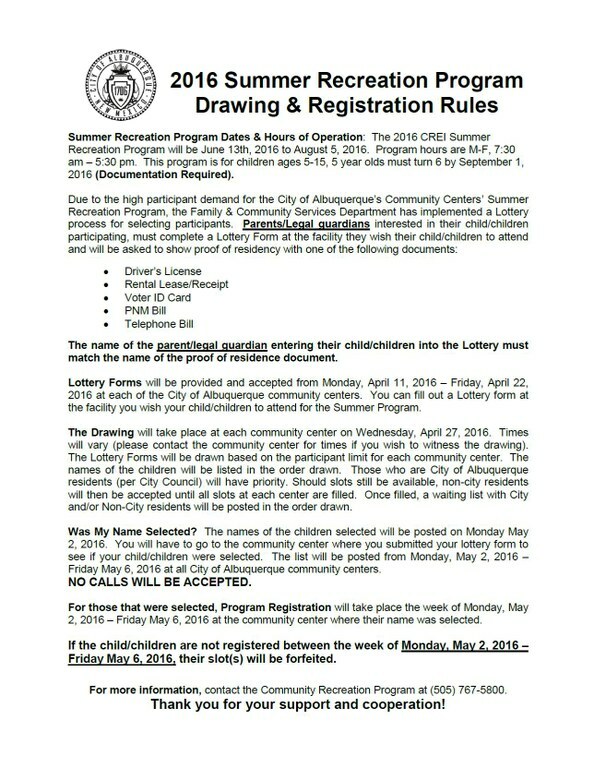 The list will be posted from Monday, May 2, 2016 – Friday May 6, 2016 at all City of Albuquerque community centers. For those that were selected, Program Registration will take place the week of Monday, May 2, 2016 – Friday May 6, 2016 at the community center where their name was selected. If the child/children are not registered between the week of Monday, May 2, 2016 – Friday May 6, 2016, their slot(s) will be forfeited. For more information, contact the Community Recreation Program at (505) 767-5800.